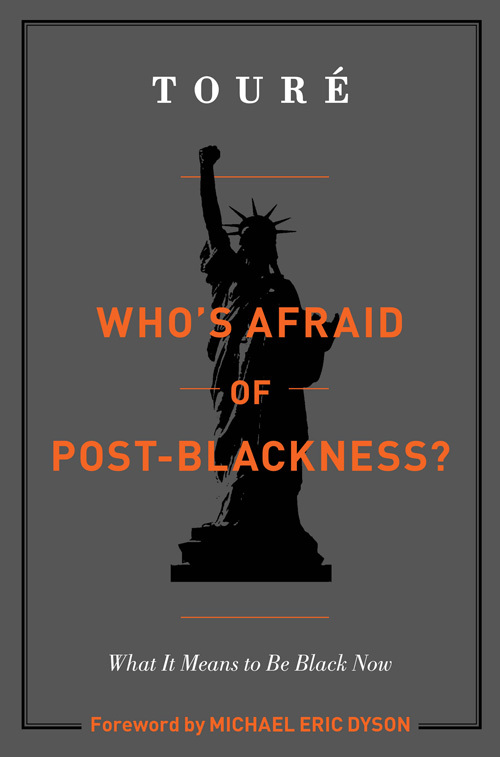 I just finished reading Touré’s recent book, Who’s Afraid of Post-Blackness. Touré 40, is an author, correspondent for MSNBC, host of two shows on the Fuse Network, Hiphop Shop and On the Record, and contributing editor to Rolling Stone Magazine. The book’s impetus seems to come from two places. The first, is Touré’s feeling that with Barack Obama as our first black President, and as a black man unlike others we have seen before on the national scene, we now have a more complex and varied definition of what it means to be black. The other force behind the writing of this book was a transformational experience Touré had in college. Touré grew up in a mostly white neighborhood outside of Boston, and attended an exclusive private school from grades K – 12, where he was again in the minority. He credited his race conscious parents for exposing him to black culture, and making it the norm for him to aim high and excel academically, as their circle included many architects, scholars, lawyers, artists and doctors who were black. In his first year of college, Touré still hung around with mostly white kids, but after reading the Autiobiography of Malcolm X as a sophomore, and having an awakening of black consciousness from this reading, he sought out friendships with black students, and connected more with his black identity through his studies and his involvement with black student affairs. That statement became an earth shattering moment for Touré and forced him to look at who he was as a black man, and how he could begin to define himself without letting, not only the white gaze do it for him, but not allowing the black gaze to define for him either what it meant to be black. Touré worked hard on his self-discovery, and refusal to be defined by others, and in writing his book, reached out to scholars, artists, and many of the brightest, contemporary minds, to get their opinions on what it means to be black today. Please let me know what you think of the book, if you do decide to read it. A few more on my list are: How To Be Black, by Baratunde Thurston, Black Cool, by Rebecca Walker, and White Like Me, by Tim Wise.